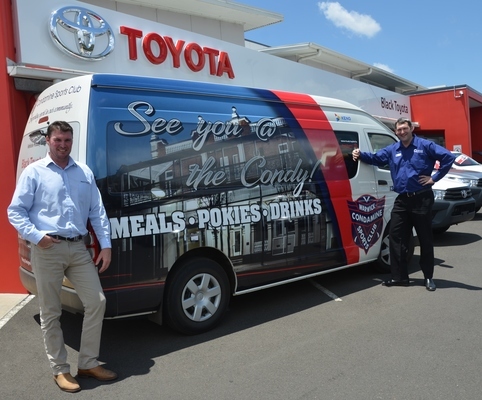 Black Toyota Warwick Branch Manager Jason Denny (left) and Condamine Sports Club Manager Stephen Domjahn with the new HiAce courtesy bus. Patrons are showing they are very keen to take up the offer of the Condamine Sports Club’s recently-purchased courtesy bus. The Toyota HiAce bus seats 12 including the driver very comfortably and the Club will happily pick patrons from the Warwick area up from home and drop them back Monday through to Saturday evenings between 5.30pm and 9pm. This means you can enjoy a beverage or two with your delicious ‘Condy’ meal or while trying your hand in the gaming area and not have to worry about driving. The courtesy bus will also transport you to the Condamine Sports Club’s Hawker Road Function Centre at the Warwick Golf Club and home again. Black Toyota Warwick Branch Manager Jason Denny said the company did a good deal with the Club on the vehicle and were happy to see it out and about in the community. The eye-catching signage ‘wrap’ on the bus – with the signature ‘See you @ the Condy’ logo was created by Warwick’s Zooma Signs. Condamine Sports Club Manager Stephen Domjahn said the courtesy bus was already proving popular with patrons, who are more than welcome to call the Club and arrange a trip. Both the Condamine Sports Club’s Sporties Grill and Bistro and the Hawker Road Function Centre offer top meal deals and more – check them out online at www.condaminesportsclub.com.au and visit and ‘Like’ the Condamine Sports Club on Facebook. To book the Condy Courtesy Bus call the Club on 4661 1911.